Angling in the UK you’re more than likely to spend a considerable amount of time stood out in the rain. As much as we’d all love to be angling in glorious sunshine, the Great British weather rarely allows for that and, as such, a good quality waterproof is as essential part of your angling arsenal as your rod and reel. Designed to cope with much more than your typical light shower as you dash between your front door and your car, this Nash Waterproof Jacket is ideal for coping with everything the elements can throw at you. The Nash Waterproof Jacket is manufactured from a high performance laminated waterproof material that will keep you dry even when the rain is pouring. The inner lining of the jacket is made from an advanced TPU material, too, which is also waterproof to double its resilience to the elements. 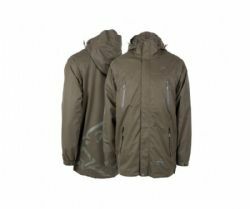 The jacket has a unique matt finish, which means it is soft to the touch and quiet to wear, allowing you to stalk stealthily along the bank without rustling. The Nash Waterproof Jacket also features a central drop mesh lining, which has been purpose designed to wick away any sweat. This increases your core warmth and ensures that you never feel damp on the inside of you clothing – especially on hot and muggy days when the rain is falling. The collar of the jacket is lined with a soft micro-fleece material, providing additional comfort and warmth that is essential on those cold spring days by the water. The hood of the waterproof can be adjusted to fit close around your face for those really windy days and it features a storm peak to stop rain from running into your eyes. This hood can also be rolled and stored inside the collar of the jacket for non-wet wear, too. The main zip on the Nash Waterproof Jacket is heavy duty and easy to use, ensuring you can quickly throw on the jacket if the rain starts up unexpectedly or if you’re face with a midnight take on a damp evening. This zip has been covered with a stop flap to prevent any rain from entering the jacket, too. Twin chest pockets and twin waist pockets provide ample storage space for any additional terminal tackle or valuable items that you’d like to have to hand on the bank. The jacket is also fitted with an internal pocket, too. If you’re looking for a brand new top end waterproof then you need look no further than the Nash Waterproof Jacket.